Born 1955, and lives in Cincinnati, Ohio. Wanderlust has led us east coast to west coast-rinse and repeat. Our return to familiar roots demanded an alternative perspective. We were drawn to Over The Rhine in 1983 as early adapters or more realistically "pioneers." We preceeded the diverse community that is still taking root. But we have moved on physically and emotionally. Friends and fellow designers at Envoi Design have long felt and retained a connection to OTR although their residences have sprouted elsewhere. Once a burgeoning focus of entrepreneurial sprit of live music, coffee houses, myriad galleries, bookstores, bars, salons, .... Until recently, interest and development have turned a few corners and walked a block to create a more sanitized version of the original concept. Main Street and the independent spirit of those impassioned individuals and start-up businesses that remain are again hoping and waiting for something to flourish. Our work and that of Denise, Steve, Phil, Jason, and Mark sometimes overlaps as collaboration. When they renovated the building adjacent to the one they had long rented, our skills in spatial design, color, lighting, and environmental graphics were recruited for the studio and condos. We frequently convene for birthday's and projects over lunch at the conference table on the first floor. Unlike our studio, uptown, near the park which requires directions to locate; Main Street can sometimes feels like a terrarium. But like the urban residents of OTR we thrive on the influx of divergent energy. One such personality is Ronald English. We first met him on Main Street as a daily component of the street life in front of Shadeau Bakery and Envoi. Until this morning we had assumed that he was still part of the scene. 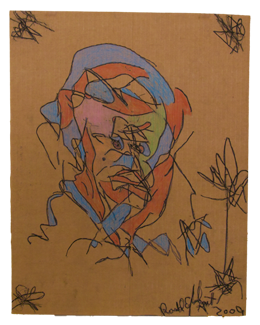 We had hoped to see him, speak with him about our intentions regarding the site and his work, and perhaps purchase one of his recent drawings. We were surprised and concerned that no one with whom we spoke had seen him for months. One friend said he thought he recalled mention of a move to a nearby city, but nothing was certain. As it works, when all else fails-google it. And we did, mostly with little success unless I was looking for the contemporary renowned street artist Ron English; friend of Sheppard Fairey. One inquiry popped up via Facebook on the wall of CS13. Someone was inquiring about Ronald's whereabouts as we had begun only hours before. We were not alone in our concerns. Facebook can be a powerful tool, with mutual friends of the young woman who knew Ronald, we sent a message. She was kind to reply, but unfortunately knew nothing more than we. 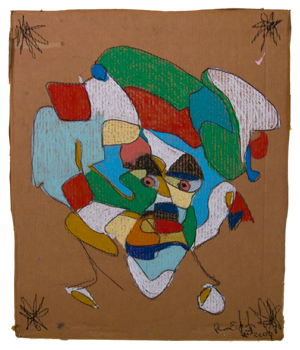 What then transpired reaffirms our conviction to the goals of intuoutsiderart. Moving in only days to NYC, she offered to give us the bulk of the work she had collected from Ronald over a period of a year and one half to add to the collection. Words can not describe how generous an offer this is, we will be good stewards of the work, with enduring hope that we can re-connect with Ronald. Our Google search also unearthed this announcement in a local publication called "Streetvibes" from November, 2008: "Ron English is a celebrity to those who know him. 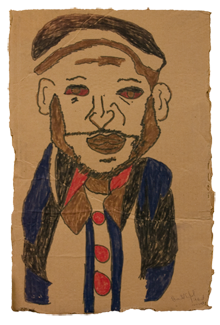 Formerly homeless, he sometimes sells Streetvibes. 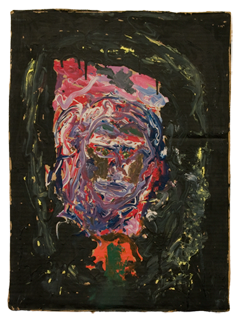 He likes to draw hyper-colorful, complex self-portraits on cardboard and other found media. Thanks to Angela Pancella’s generosity and appreciation for art, you now have the opportunity to obtain one of English’s works. 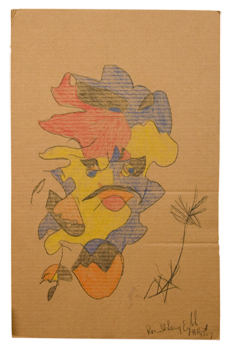 Pancella, director of development at Our Daily Bread, purchased the drawing, which will go up for auction Dec. 4 at the annual dinner of the Greater Cincinnati Coalition for the Homeless." Arrangements were made to pick up Ronald English's works, the night before Heather Glenn Rock's NYC departure. We drove down to Main Street bustling with the activities of the monthly "Final Friday." We knew our destination and began looking for a place to park. 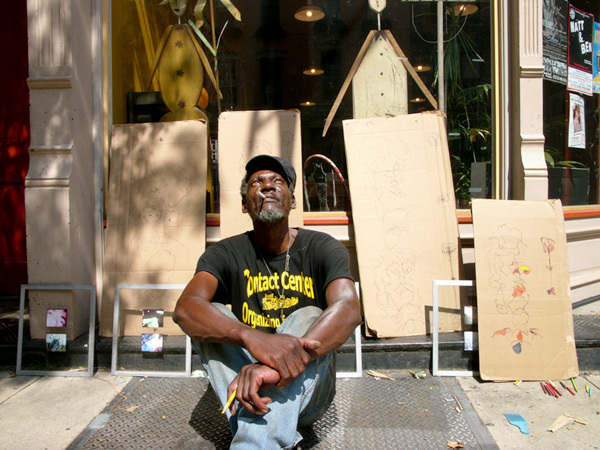 We saw Ronald English sitting on the stoop of a local writer's guild known as "Ink Tank." 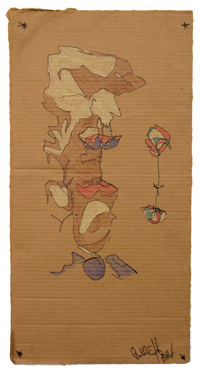 He was conversing with passers-by and had cardboard and his colored pencils. He waved excitedly and raised a framed piece as a flag. We parked and by the time we had gotten to the storefronts of Shadeau and Envoi, he had already made his way down the street. 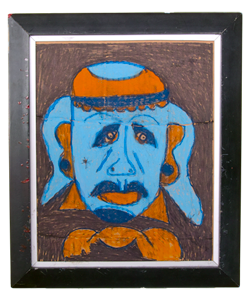 He said he had heard about "the website" and said he wanted to sell the drawing he had done of a personality from "American Idol." He said "it looks just like her... it's Susan Boyle." Honestly, we heard the name but forgot the context of Britain's Got Talent the other side of the pond's American Idol. We recall still images we had seen of the curly haired 40 something woman for whom Ronald had paid hommage in this recent work. We purchased the work and began to pursue answers regarding his absence. He explained that he had been in the hospital for months recovering from the amputation of six more toes. He had previously had three removed results of gangrene. Of course, we told him that we and others had been concerned and were relieved that he was safe, though he appeared a bit weary. We explained our purpose for our trip to Main Street that evening. A young man walked up and was greeted by Ronald as a friend. Scott lived in the apartment across from Heather's and along with Heather's fiance Matt, was also a supporter of Ronald's work. Ronald asked for a ride home, we said we had an errand to run and would do so upon our return. We climbed the stairs to the apartment filled with boxed contents in lieu of movers. Heather and Matt graciously showed us all seven pieces from which two were chosen to be included in the move. One was a piece that was a traditional "self portrait" the other was quite dissimilar yet still a portrait. It was in primary colors, very strong and graphic. Heather, Matt, and we spoke about the direct or obvious transference of Ronald mood to the tone of the work. Choices in subject, tone, color, fragmentation, ... all appear as parallel. The remaining pieces were fine examples of English's work, one larger piece is outstanding. We left the two to continue packing the remains of their time in Cincinnati. Ronald had remained patiently on the sidewalk, in hopes of our sincerity. He was surprised and pleased to see his works from past; happier still to know our plans to include them on his page on the site. 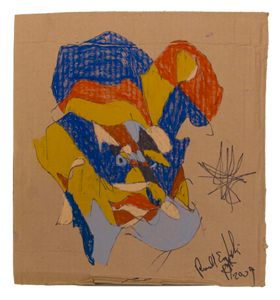 We packed the art and Ronald into the car and in the ten minute drive we pursued some of the questions we had wished to ask Ronald days earlier. We told him to meet us next week to discuss further questions, to show him the site, and his "page." We felt it would help him understand the company he was keeping with other artists about whom we shared interest. 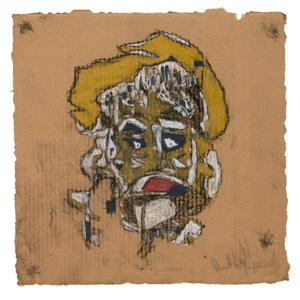 Ronald English was born in Cumminsville, an urban neighborhood in Cincinnati. He was born on June 4, 1955. He attended school and claimed to have won several spelling bee competitions. He excelled in sports, particularly basketball as a center. He has mentioned that he has a "bunch" of brothers and sisters and half-brothers and sisters. He served in the Army National Guard although he did not serve in Vietnam. During the time he was away, his mother was brutally murdered. He returned to discover he had no remaining possessions or a home. 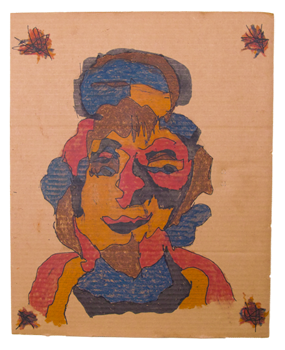 He has resided in a boarding house and stayed in a hotel, as well as the Drop Inn Center and Behavioral Services. 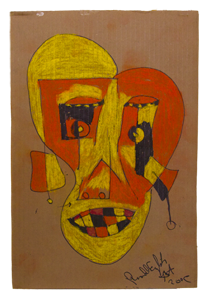 Having lived on the street he has experienced the desperation associated with substance abuse. He began drawing in 1998. He says he was staying in a room with the door open and he woke up to see paint cans in the hallway. This was his epiphany. We have one drawing dated October 14, 1999. Drawing has become a bit of an obsession but he also uses his art as a quick means to cash. He has recently begun to take out books from the library which explore the art of sketching cartoons. 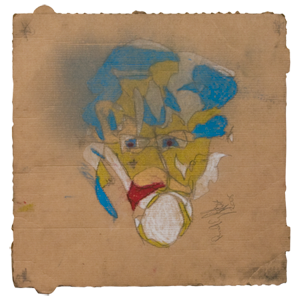 He draws primarily on cardboard which is readily available but when materials are available, he will paint. He has done work thorough various support networks including Visionaries and Voices, as well as other behavioral services associated with mental disease. But Ronald usually prefers to sit on the stoops and stairs of welcoming businesses to create his drawings and speak with people as they come and go. 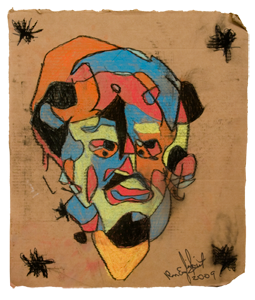 Consistent to date, he always draws or paints faces as his subject matter. We look forward to continuing our interview with Ronald and adding to what we know and may share. We hope that Ronald's recent hospitalization is the last he will require and will also result in greater emotional stability. These are the five pieces that have been so graciously given to the collection.